5 oz 2018 Mexican Libertad Silver Coin | ?? You won't find a better price on your order of a 5 oz 2018 Mexican Libertad silver coin than the one you'll pay from our store online today. Established in 1535 by the Spanish Viceroy, Casa de Moneda de Mexico isn't only the proud mint of the ever-popular Mexican Libertad, it is also the oldest mint in the Americas. The coin's reverse features a well known Mexican vista, where the mythical lovers Iztaccihuatl and Popocatepetl, the country's great paired volcanoes, keep vigil over the landscape, in the fore is a flowing portrayal of lovely 'Winged Victory.' These powerful symbols of Mexican liberty are encapsulated by the coin's year of issue, weight and purity. The obverse of the Libertad is home to Mexico's magnificent shield, meticulously depicting the eagle, snake and cactus, all familiar symbols of the country. This beautiful shield is surrounded by 10 smaller versions which were used throughout history, plus the nation's legend, Ustados Unidos Mexicanos. The Libertads share the pride of proud mintage at one of the most recognised mint in the world. No discerning enthusiast could pass up the opportunity to own the immaculate 5 oz Mexican Libertad silver coin today. 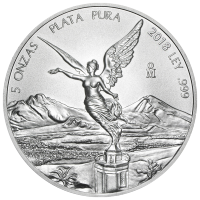 5 oz 2018 Mexican Libertad Silver Coin You won't find a better price on your order of a 5 oz 2018 Mexican Libertad silver coin than the one you'll pay from our store online today. Established in 1535 by the Spanish Viceroy, Casa de Moneda de Mexico isn't only the proud mint of the ever-popular Mexican Libertad, it is also the oldest mint in the Americas. The coin's reverse features a well known Mexican vista, where the mythical lovers Iztaccihuatl and Popocatepetl, the country's great paired volcanoes, keep vigil over the landscape, in the fore is a flowing portrayal of lovely 'Winged Victory.' These powerful symbols of Mexican liberty are encapsulated by the coin's year of issue, weight and purity. The obverse of the Libertad is home to Mexico's magnificent shield, meticulously depicting the eagle, snake and cactus, all familiar symbols of the country. This beautiful shield is surrounded by 10 smaller versions which were used throughout history, plus the nation's legend, Ustados Unidos Mexicanos. The Libertads share the pride of proud mintage at one of the most recognised mint in the world. No discerning enthusiast could pass up the opportunity to own the immaculate 5 oz Mexican Libertad silver coin today.